The 2018 Midterm election results are in. Republicans retained control of the senate, winning 51 seats at this time compared to Democrats 44 and other parties 2. There are still two seats that are undeclared. Democrats, however, were able to take control of the House of Representatives winning 225 seats compared to the Republican party’s 197. There are still 13 seats left undeclared. It is going to be interesting to see what happens in congress now that Republicans no longer have full control. Democrats will now be able to check president President Donald Trump at a legislative level. They also will be able to demand Trump’s tax returns and investigate corruption across the executive branch. Hopefully, we will be able to clear up the mess that was the Russia scandal and find out once and for all if the President knew about Russian interference in the 2016 presidential election. On another note, it is a welcoming sight that neither the Democratic or Republican party have full control of Congress. The last few years of full Republican control have shown it is good for no one when one group has majority control over another. Congress should be about both parties coming together and agreeing to compromises that are beneficial to America as a whole. I cannot remember the last time Republicans or Democrats for that matter worked together instead of digging in their heels and playing the game of partisan politics. Hopefully, we will see Republicans and Democrats working together in congress instead of the bickering and fighting we have become accustomed to over the last four years. Now to end this article on a high note, it was absolutely fantastic to see so many women elected to congress. Women have been underrepresented in politics for far too long, and it was great to see over 100 winning seats in the midterm elections. When the current congressmen/women’s terms are over it also means we will have a record number of women serving in congress. 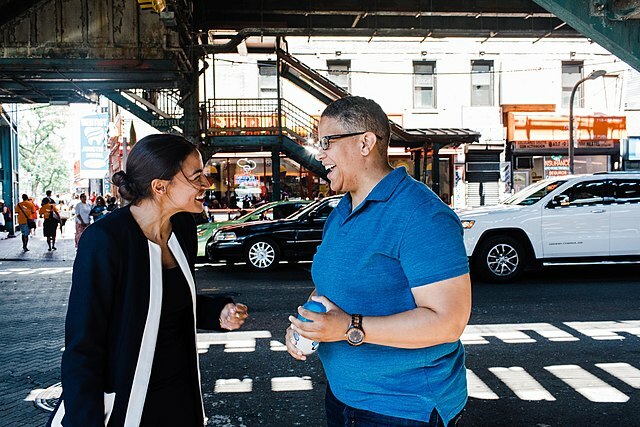 Photos contributed by commons.wikimedia.org: Alexandria Ocasio-Cortez (pictured left), was elected on Nov. 6, 2018, as United States Representative-elect for New York’s 14th congressional district. One has to wonder if our current president is one of the main reasons more women ran for office and were elected. I am sure the tape recording that was revealed of the president’s derogatory comments towards women during the 2016 election campaign which he brushed off as “locker room talk” is still in everyone’s minds. Either way, it is a great victory for America to have so many qualified women elected to office. Hopefully this is also just the beginning of a trend which will see more and more women continue to be elected to congress until there is an equal or greater number serving than men. I also have hope that this is a signal that we will eventually will have a female president in the white house at some point in my lifetime.